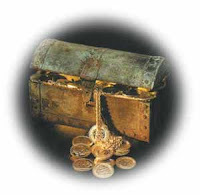 In my previous two posts on Regency money, Regency Money and The Worth of Regency Money, several people said they liked and needed the information. So, this post is a compendium of some historical money links I've discovered in my research. They include, but are not limited to, Regency money. The best site I've found is Current Value of Old Money, a GREAT collection of links about historic money in various countries, including historic exchange rates. Another good link is the Marteau site, which contains information for the eighteenth century for various countries. Here's the Marteau site's A Platform of Research on Economics History, which is included on the Current Value of Old Money site. From the above page, here's the Marteau Prices and Wages page, which gives historical money information on France, Germany and Austria, Great Britain, Italy, the Dutch Republic, the Ottoman Empire, Spain, and the Spanish Netherlands. From the above page, here's the link for Great Britain, Wages and Prices in 18th Century England. For example, a 1710 English clergyman made about 99 British pounds per year. The Measuring Worth site contains many calculators, as well as historical information, mainly for the USA and Great Britain. All this data can be pretty dry, but here's an article, Vulgar Economy, from the Jane Austen Centre that gives some idea of the cost of common items in Regency England. And to end the post on a lighter note, here are some slang expressions for British money. Not all the terms are historical, but the definitions are enlightening. P.S. The above picture is old Croatian money.